The thing about not posting regularly is that now there’s too much to catch up on! Since my last written-for-the-blog post about the two weeks I spent decluttering the house what have I done apart from the usual run-around? Gone dress-shopping with her for said event. Read half of a highbrowish (for me, which means it’s not really too highbrow) book, The Hare with Amber Eyes by Edmund de Waal. I usually steer well clear of biographies but this is a pretty worthwhile exception. Will try to get down some thoughts about it once I’ve finished. Baked some brownies (dry) and cheese muffins (better), tidied up the garden and the shed, helped my mother with a meeting and some paperwork, hosted a mothers’ group/play date, watched two X-Men movies for the first time (surprisingly liked them a lot), and gone to two catch-ups with friends. In other words, quite a lot, although it never feels as though I’ve done much. I’d been itching for a writing-related project, and now suddenly have three on the go and have been spending a bit of time on the weekends behind the closed door of my home office. Not a lot, just one to two hours on a Saturday or Sunday afternoon. But it’s taking a while for the kids to remember that when the door is closed, that means Mama doesn’t want anyone throwing it open and barging in asking for paper, pens, roller blades, or books that might be left in there. And it’s taking a while for Mama to remember before she settles into the office to make sure she puts the paper, pens, roller blades, and random children’s books are on the other side of the closed door. Last Saturday I got pretty ticked off after the fourth interruption in 10 minutes and gave the fourth interrupter who wanted some paper for drawing a very cranky lecture about the meaning of a closed door, the fact that I was trying to concentrate and that his father should be the first point of call for a while, and the need to at least knock before barging in. He ran off wailing, and I felt a jab of guilt because he’d been the only one to get into trouble and I had never actually told them I wanted to be left alone. (Telling them wouldn’t have made a difference, but still.) But then all was quiet so I figured he was ok and went back to work. A few minutes later I heard the soft shhhh of a small concertina of paper being slid under the door. Can you believe this is actually from one of my more affectionate children? Those three big words are clear enough, along with the pictures. 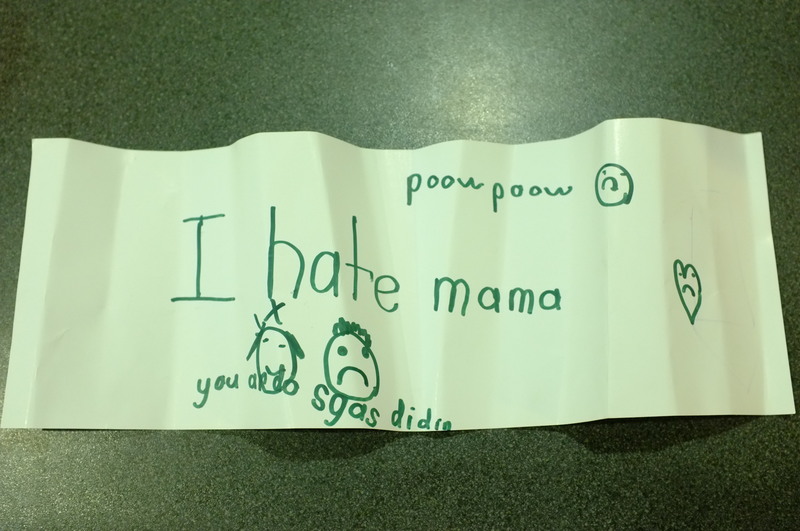 I think the ‘poow poow’ is ‘poo’ and is just meant to be a ‘naughty’ word for my viewing displeasure, but I couldn’t make out the writing along the bottom. No matter. I went straight out to the offended (and offending) child and we made up, although his missive did earn him a little talk about the use of the ‘h’ word which I thought was a bit strong. I showed the note to Peter that night when the kids were all in bed and after frowning over the last part for a few seconds his eyes widened and then his mouth. I looked again. Huh! So ‘hate’, bad as it was hadn’t been bad enough for expressing his indignation at me. “I hate Mama. You are disgusting.” Righto. That actually packs quite a punch. Thanks kid. It just goes to show that spelling matters a lot when you want to get a point across, but not as much as knowing exactly what you want to say and making that message plain and clear. I’m thinking that with an ability to calmly control and direct his passion like that he’s got either the makings of a fine writer or a criminal mastermind. I’m also thinking I might try taking my laptop to the library to do some work next time. Yes, and I’m really glad he’s not armed with any worse words! Oh chuckle chuckle chuckle. That’s all too cute. And such a big word for a five-year-old. No wonder he had trouble with it.